King Djoser was the one who started this completely magnificent epoch, as he was the first pharaoh of the Third Dynasty in the Old Kingdom of Ancient Egypt. He was known with other names including Tosorthros, Netjerikhet, and Sesorthos. His father was king Khasekhemwy and his mother was queen Nimaathap. King Djoser ruled for about twenty years and he is best known for his step pyramid, which is the first pyramid in Egypt. In the Egyptian Museum, there is a painted limestone statue of King Djoser, which represents the oldest Egyptian statue. There is a copy from this statue stands next to the original one in Saqqara. King Djoser was known as Netjerikhet, which means “divine of the body” and he succeeded his brother to the throne. His reign witnessed a great technological innovation in the use of stone architecture. 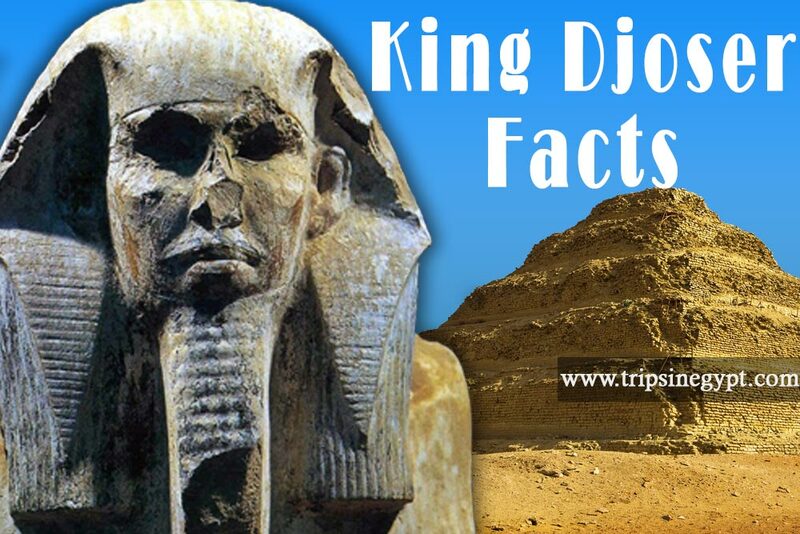 We don’t know much about King Djoser’s personal life and his family. King Djoser was the son of Khasekhemwy and Nimaathap. He married Hetephernebti, and the evidence on this is a fragment of relief from a building at Hermopolis. He had two daughters but only was known by the name, Inetkawes. The name of the other daughter was destroyed and we don’t know anything about it. The date of King Djoser’s death is uncertain and he was buried in his famous Saqqara Pyramid in Lower Egypt. When he reached the throne, he immediately started with the construction of his building projects. The age of King Djoser was full of achievements and it witnessed many events including the construction of architectural monuments, agricultural developments, trade, and the rise of the cities. He also succeeded in securing the country, which helped in preserving the stability of Egypt in his reign. Through his military expeditions, he expanded the realm into the region in the Sinai Peninsula. That is not all, he was able to gain victory over the Libyans so the armies of King Djoser were able to bring honor to his name and to his country. He also used to mine for valuable minerals such as turquoise and copper by sending expeditions to Sinai. Another achievement of King Djoser was fixing the southern boundary of his kingdom at the First Cataract. His main achievement was the Step Pyramid of Saqqara, which was the first pyramid to be built and was the starting point of many mastaba tombs one after another. It was built in the first place as a square mastaba but after that, they added five more mastabas to it and it became a step pyramid, which is made of polished white limestone. It contains one tight corridor, which leads to the close midst of the monument. It is 62 meters high and the measurement of its base is 125 X 109 meters. It was built by very skillful Egyptian builders not slaves and it was the tallest structure of that time and became a famous tourist landmark visited by many tourists. Kings before were buried in mastabas, which were established of clay brick but the step pyramid was built through six mastabas lying above each other and each one is smaller than the one beneath. Around the complex, there is a temple, many courtyards, chapels, and living quarters of priests. About 11.6 million cubic feet of stone and clay were used in constructing the pyramid. Inside the pyramid, there was a courtyard that contains many cultic buildings such as the southern pavilion, the entrance colonnade, the southern tomb, and the famous serdab. This serdab includes a seating statue of King Djoser. So, we organize Cairo day trips to discover & witness the Step Pyramid of Saqqara. It is an inscription date back to the Ptolemaic period, which started from 332 to 31 BC after the reign of King Djoser. It is written Egyptian hieroglyphs and was located on Sehel Island in the Nile. This astonishing stele narrates how the king saved his country. Unfortunately, it was broken and no one knew how to fix the problem but it shows how King Djoser rebuilt the temple of Khnum on the island of Elephantine at the First Cataract. It also tells a story of a seven-year period of drought and famine during the reign of Pharaoh King Djoser of the Third Dynasty. Imhotep was King Djoser’s main viziers. He supervised the construction of King Djoser’s tomb in addition to the tomb of King Sekhemkhet. The name of Imhotep was mentioned in the famous Papyrus Westcar but because the Papyrus was badly damaged, the name of Imhotep was lost. Imhotep was so important to King Djoser and that’s why he mentioned Imhotep’s name in many of the inscriptions in Saqqara Necropolis. Finally, if you prefer to visit the monuments of King Djoser in Saqqara beside the other landmarks of Pharaohs, Please check our Egypt Tour Packages and let us transport you to another fantasy world in Egypt.